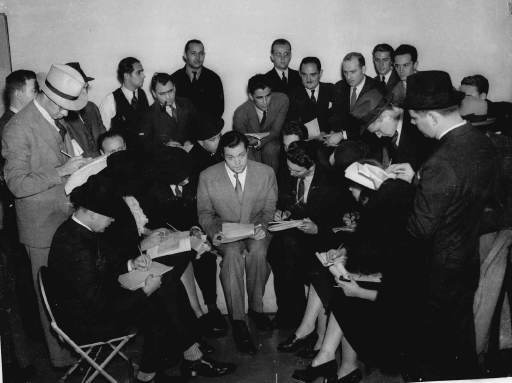 Today marks the 75th anniversary of the Mercury Theater on the Air’s radio production of “War of the Worlds” — a dramatization of a Martian invasion that put both Orson Welles and Grovers Mill, N.J. on the map. A recent PBS documentary discussed the broadcast and the fallout from it — angry listeners who thought the whole thing was real, that Martians were using poison gas and heat rays to rip up a good chunk of the East Coast, and that civilization as we know it was as good as roasted — and on the day before Halloween, no less. How far did the hoax go? Well, it definitely made its way to Annapolis, according to this excellent find by Proceedings magazine’s Fred Schultz over at the U.S. Naval Institute’s blog. Beach recalls grabbing his robe and hustling past rooms full of anxious mids listening to their radios, no doubt contemplating future deployments against an invading alien horde. Beach reached Lt. j.g. C.C. Kirkpatrick and filled him in; the officer turned on the radio. “The luridly dramatic depiction was in full gear, and his face turned ashen,” Beach recalled in the piece. When the radio report mentioned aircraft arriving from Langley Field to fight the invaders, something clicked in Kirkpatrick’s head — the planes were arriving too fast for the account to be accurate. The young officer did some quick recon that was skipped by many who fell for the hoax, turning the radio dial to find out that no other stations had decided to break into regular programming to cover the end of humanity. A cartoon depicting Beach running through the hall in his robe, delivering a sitrep on an interplanetary conflict, ran in the weekly Midshipman’s Log magazine, Beach recalls — USNI’s blog reproduced it. How would Beach’s career recover from such an embarrassment? Submarines he captained damaged or sank 45 enemy vessels during World War II, according to his 2002 New York Times obituary. As for Kirkpatrick, his time in Annapolis was far from over.